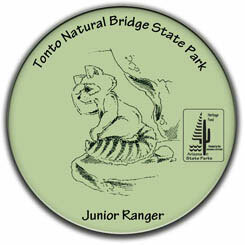 If you're between ages 6–12, you can become a Junior Ranger at Tonto Natural Bridge State Park! Pledge to do your part to help preserve the beauty of the park for everyone to enjoy! 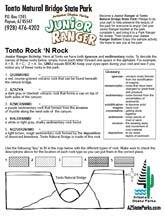 Tonto Rock 'N Roll: Here at Tonto we have both igneous and sedimentary rocks. To decode the names of these rocks below, simply move each letter forward one space in the alphabet. For example, A = B, B = C, Z = A. So, QNBJ equals ROCK! Keep your eyes open during your visit and see if you notice any of these rocks in the park.